We seek K-12 teachers who are interested in exploring how to teach math and/or science more effectively. You do not need to be a math or science expert to join the program. You do, however, need to have an interest in furthering your knowledge of math and science ideas in the K-12 curriculum, how children think about math and science, how math and science instruction can empower all children rather than an elite few, and how research can improve instruction. spans four semesters and no summer classes. The program consists of 24 units of coursework if you have earned 6 units of credit in a graduate or post-baccalaureate credential program within the last five years. If your coursework is more than five years old or your credential was earned as an undergraduate, you will need to take an additional six units. Additionally, this program offers the option to add on Foundational credentials in Mathematics and Science. We offer the coursework that is required by the California Commission on Teacher Credentialing. In order to add on Foundational Math or Foundational Science credentials, students must also maintain a preliminary Multiple Subject or Single Subject credential and pass the appropriate CSETs. For information about free CSET preparation classes, visit the MSTI website. The entire program spans two years. Teachers take two courses each fall and spring semester and will have summers off. See below for a table of the tentative course sequence. 1 This course fulfills the coursework requirement to add on a Foundational Mathematics Credential to your existing credential. Additional CSETs also required. 2 This course meets the coursework requirement to add on a Foundational Science Credential to your existing credential. Additional CSETs also required. 1. What if I am primarily interested in teaching mathematics? What if I am primarily interested in teaching science? While you will take courses in both math and science, there are opportunities within the coursework to focus on your preferred content-area specialization. There are 8 classes in the program, two of which will explicitly focus on math and two explicitly on science. An action research course in your last semester will allow you to focus on your preferred content area (or combine math and science). The remaining three courses use math and science as a context for exploring curriculum, assessment and teaching diverse learners. Do I need to be an expert in math or science or both to join the program? Definitely not! You do not need to be a math or science expert to join the program. You do, however, need to have an interest in furthering your knowledge of mathematics and science ideas in the K-12 curriculum, how children think about mathematics and science, and how mathematics and science instruction can empower all children rather than an elite few. I am a full-time teacher. Will I be able to complete this program? We have structured the program to accommodate the schedules of full-time teachers. In addition, you will be able to integrate much of the coursework into your own classroom instruction. Each course is three units and requires three hours of class time per week. Fall and Spring courses will be offered from 4:20 - 7 PM on Mondays and Thursdays. 4. Do I have an opportunity to earn a masters and credential? A preliminary teaching credential is required to enter the program. However, this MAT program also offers the coursework required to add on credentials in Foundational Math and Science. Additional CSETS are required in addition to the coursework. 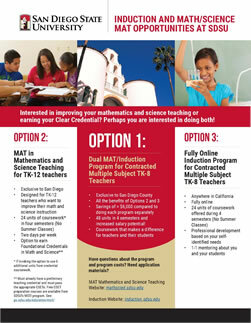 Free preparation and test fee reimbursement is available through SDSU’s Math and Science Teacher Initiative (MSTI). Visit the MSTI website for more information about CSET Prep courses. 5. What are tuition costs? For information about tuition and registration at San Diego State University, please check the Student Account Services' Tuition and Other Fees page. To check on costs, note that students in this program take 6.0 graduate units per semester. 6 . Am I eligible for financial aid or scholarships? The Financial Aid and Scholarships Office encourages students to apply. For more information, contact SDSU’s Financial Aid and Scholarship Office at 619-594-6323 or search for scholarship opportunities at the SDSU Scholarship Search page. Select Major/Credential of Educational Research, or All Programs. Also, visit the SDSU Scholarships page. 7. What are the major components that are required to complete this program? Thoughtfully complete the appropriate coursework and maintain your GPA in those courses to a level acceptable by program directors and university guidelines. Take and pass a required Comprehensive Examination. Project Directors will provide you with guidelines regarding the exam and will provide suggestions for studying. Complete a Master of Arts final project as part of your coursework. 8. Do I have to take the GRE? Yes, the university requires GRE scores for the general test, and you need to take the test before you can be admitted to the university. We have heard from some prospective applicants that taking the GRE can be stress inducing. The GRE scores are but one of several factors used to determine whether an applicant is admitted to the program. An excellent essay, GPA, letter of recommendation, or other measures can offset less-than-stellar GRE scores. We encourage you to apply! Scores from previous years are acceptable. You will need to provide a copy of the scores sent to you by the Educational Testing Service or request that they send official GRE scores directly to San Diego State University. The institution number for San Diego State University is 4682. You can take the exam on campus (619-594-0968) or at the Prometric Test Center at 5075 Shoreham Place, Suite 180, San Diego, CA 92122 (858-866-2120). If you took the exam in past years, you may also mail a copy of the scores to the Graduate Admissions Office. To get additional information, you can call 1-800-GRE-CALL or go to the GRE website. You will submit two applications: One to the university and one to our program. Transcripts only need to be submitted to the program (not within the university application). To apply, visit the MAT How to Apply page at COE Admissions. For questions about Cal State Apply, please contact coeadmissions@mail.sdsu.edu. Interested in improving your mathematics and science teaching or earning your Clear Credential? Perhaps you are interested in doing both! Fourth grade student shares his clever strategy for solving -3 + 6 = __.